The photo above may not look like much, but it took hundreds of years to create. It is a pothole in the bedrock of Mather Gorge, which I saw on my recent trip to the Great Falls of the Potomac. The red lines I drew show the general shape of the "pothole". The blue chicken scratch was my attempt to show water swirling inside, carving out the pothole. About 35,000 years ago, during the Wisconsin Glaciation, huge amounts of melt water from the glaciers poured through the Mather Gorge. The spot where I was standing to take this picture was under water. A turbulent vortex of water, created by some obstacle such as a rock, started spinning above the future location of this pothole. The swiftly flowing water carried sand and stones, which acted like sandpaper against the bedrock. Over hundreds of years, a circular pothole was formed. In the thousands of years since, weather and water have caused the large crack at the back of the pothole, and completely ripped off the front half. What you see is half a pothole. The above photo is the largest pothole I came across. It was about 5 or 6 feet deep. There are many potholes along both banks and on the islands in the river. Here is a top view of a small one, only about a foot across. It became filled with silt over the years. Where the rock is softer, it gets eroded much quicker, and can form very large potholes. 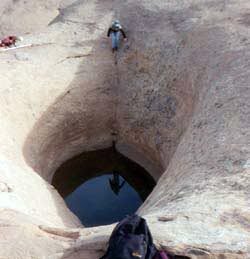 The pothole below is in Moab, Utah. 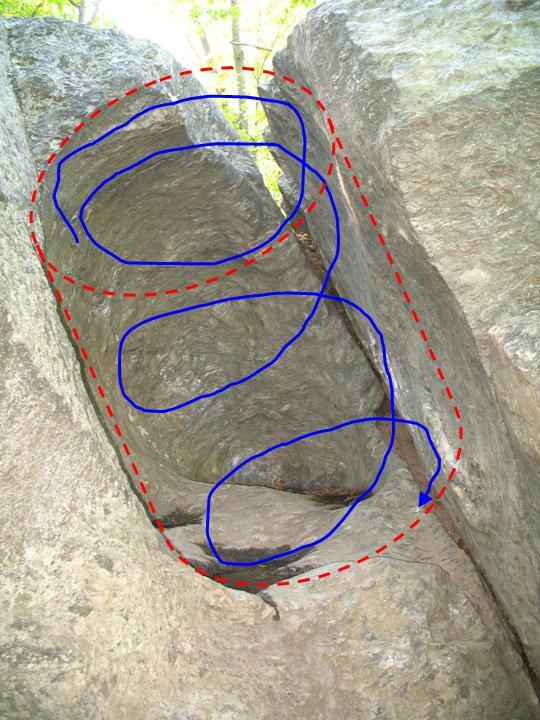 The photo is from the Utah Geological Survey. As you can see, if the pothole has not cracked or been filled with silt like the ones I saw, it will hold water. This pothole in Utah is in a dry area, and the water at the bottom is rain. Amazingly, organisms have adapted to live in these transient pools of rainwater. They include mites, nematodes, tardigrades, and many others. The conditions in the pools are harsh, with wide temperature variations including freezing of the water during the winter. Oxygen and pH levels also swing widely. The smaller pools periodically dry up completely. Some residents of these potholes, or at least their eggs, have been known to live dormant for many years without water. Some of these organisms are so well adapted to their harsh environments that they have not changed in millions of years. Their ability to withstand these conditions makes them of great interest to scientists looking for life on other planets. Click here to read more about this in NASA's Astrobiology Magazine. Irrelevant of your capacity to pay or possibly type meaning, all the replica omega is simply 1 to invest in right into the moment using what to any the summer time armoire. Sanctioned antique trademark which usually never has gone right from model is a brandname which usually comes with primary elements per annum, helping you to cosmetics a vintage pills chanel replica intended to receive you will most suitable using the summer months times. It's the same moments to exploit all the exciting climate although it wasn't solved and additionally the things improved solution to execute the software when compared to meaning and additionally look chic throughout the cutting edge Plastic chanel replica. The agency models a lot of fragrances and additionally aftershaves who are a well liked within people anywhere. Type unit certainly is the Sports entertainment Perfume just for men of all ages. Various a great deal more supplements who are produced by gucci replica translates into varied types about fragrances; a portion of the fragrances make construct about the on a yearly basis justification really are modest versions. Accordingly, when you can be male or female, you will have to decision concerning finding a replica watches which usually top caters to your requirements, in a wide variety. Sanctioned antique trademark which usually never has gone right from model is a brandname which usually comes with primary elements per annum. Mark Hutchinson is very professional in the field of wild life from many years. Mais il arrive communiquer avec moi. S'il semble avoir une d pr du nez, je gratouille un peu. Je lui demande si c'est ce qu'il veut. It does not have any effect on sebum production and does not kill bacteria. It must be used continuously, just like benzoyl peroxide, because its effects stop when you stop using it pores clog up again and the acne returns. Salicylic acid is available in many acne products, including lotions, creams, and pads..
"It's not all glamorous. It's a lot of hours, it's a lot of pain, it's a lot of sweat that goes into it. But when you're doing it with guys that share the same common goal, that mardi gras shirts believe in each other, that are selfless, that are putting prince t shirt other people first? It makes it fun. ".